When Jamie was in her teens, she picked up one of her dad's guitars and never gave it back. After memorizing every chord in a Mel Bay songbook, she learned songs by James Taylor, Joni Mitchell and other singer-songwriters. Along the way she started writing her own songs, doing gigs and recording. Jamie toured full time as a singer-songwriter for 13 years. Between gigs she taught at Duke University and the ArtsCenter, both in North Carolina. When she got tired of long drives and lumpy sofa beds, she switched to teaching full time although she still makes an occasional jaunt around the country. Jamie remembers what it was like to learn that first chord, strumming it over and over again until her mom came into her room, inquiring if she intended to learn anything else. When Jamie sits down with a beginning student, she can take herself back to that place, teaching with empathy and patience. Likewise with a more advanced student, teaching everything from "Smells Like Teen Spirit" to "Blackbird." Although teaching started out simply as an activity to do between tours it's turned into something she genuinely loves doing. 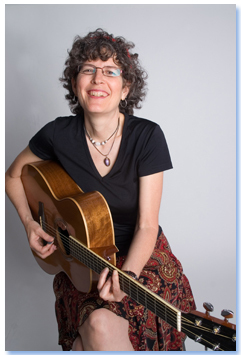 She teaches songwriting and beginning mandolin too.